The Italian Government: left to right, Di Maio, Salvini, Conte. In Hungary, we have for years had a patriotic government under Viktor Orbán, who has regularly and explicitly denounced the threat posed by replacement-level Afro-Islamic immigration and multiculturalism. In Poland, a somewhat less interesting national-populist regime has also come to power. The EU institutions regularly denounce these governments as “violating the rule of law.” For the most part, as in the United States, liberals in Europe seem to consider that “violating the rule of law” in practice means “doing what liberals dislike,” no matter what the people want or what the law actually says. In both Hungary and Poland, the populist governments have maintained their popularity and have pledged to protect each other by vetoing any EU sanctions from Brussels. Great Britain’s ongoing withdrawal from the EU is causing no small of angst in the British government and passionate hysteria among liberals. In practice, not much seems to be happening. The end result will likely be a minor modification of Britain’s economic relation with the Continent: the EU budget will have have a big hole where the British taxpayer contribution used to be, while Britain may suffer (at least in the short term) from reduced access to the European common market. By far the most interesting and possibly significant development has occurred in Italy. In June of this year, an unprecedented government came to power led by the nationalist Lega Nord (LN) and the populist Five-Star Movement (M5S). The Lega was formerly a regional party whose main concern was frustration with southern Italy’s being a massive economic liability to northern Italian taxpayers; however, they also opposed immigration. Under the young and charismatic Matteo Salvini, the party has re-focused on being anti-euro and, especially, anti-immigration. The Five-Stars Movement are in contrast a strange, uniquely Italian phenomenon, founded by the comedian Beppe Grillo. The M5S is a kind of pure-populist party, focusing on direct democracy, transparency, hatred of the (overpaid and corrupt) Italian political class, and . . . free money. Indeed, southern Italy, where unemployment is rampant, voted for M5S on the basis of a promised universal basic income. Italy has the highest percentage of young people Not in Education, Employment, or Training (the so-called NEETs) in the entire EU. The M5S-LN government is an example of the “beyond-left-and-right” populist anti-globalization alliance which had been theorized and promoted by the French civic nationalist Alain Soral. One doubts such a strategy could work in many other countries. In Italy, however, one is struck at how successful the new government has been. This is somewhat surprising, given the usual chaos and instability associated with Italian politics. In practice, there has been an effective division of labor between the Lega and the Movement: led formally by the independent prime minister Giuseppe Conte (who handles international summits), Mario Salvini deals with immigration and policing as interior minister and M5S’s Luigi Di Maio serves as economy minister. The globalist Italian establishment and liberal newspapers have completely lost control of the situation. 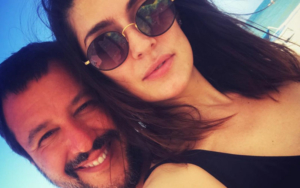 Salvini on the beach with his “domestic partner,” TV hostess Elisa Isoardi. Salvini has thrived in his new role. Viciously attacked on a daily basis, he replies with “un bacio e un sorriso” (a smile and a kiss), and knows instinctively what makes for a killer tweet, an energizing embrace of the crowd, or don the suit and tie for a formal speech. Salvini has ostentatiously taken on the EU by blocking access of NGO ships bringing illegal immigrants onto Italian shores. We need more time to see what will be the result in practice (Salvini has pressured other EU states to take on Italy’s migrants . . . which hardly resolves the issue), although a further drastic reduction of migrant flows to Europe via the central Mediterranean seems likely. Left-wing Westerners have abandoned the very notion of law enforcement concerning immigration. There has also been progress in this area under the new Italian government. Domenico Lucano, the mayor of Riace in southern Italy, a village of 1,800 people, made a name for himself by welcoming 450 migrants. Lucano, a communist sympathizer according to Le Monde, is has been arrested for facilitating illegal immigration and organizing fake marriages so migrants can get residence papers. In enforcing immigration legislation in accordance with the will of the Italian people, the populist government is restoring both democracy and the rule of law. I’m paid by citizens to help our young people start having children again the way they did a few years ago, and not to uproot the best of the African youth to replace Europeans who are not having children anymore. … Maybe in Luxembourg there’s this need, in Italy there’s the need to help our kids have kids, not to have new slaves to replace the children we’re not having. Asselborn, with all the self-righteousness of the representative of a tax haven, responded: “Merde alors!” In short, Salvini, like Orbán, argues that Europeans need more children, not more migrants. This is an absolutely true statement from both an economic and, far more importantly, a biological point of view. Polls showing support for the Lega Nord in green and for the Five-Star Movement in yellow. 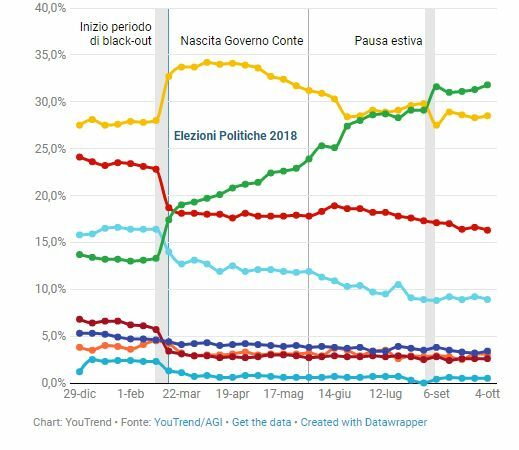 Furthermore, the Lega has become steadily more popular with Salvini in power, overtaking the Movement as the party with the greatest public support. I have long thought there is a huge craving in among our people for patriotic government. Salvini is reaping the fruit. The Movement and the Lega are now polling at a combined 60%, which means they could handily win new elections, with possibly an even bigger majority, if necessary. Certainly, Italians are very tired indeed having to bear the brunt of the migrant crisis, with often gruesome African crime, and the EU’s incoherent economic management. Furthermore, both M5S and the Lega understand the need for cultural change as part of political change. Di Maio has he would purge the journalistic “parasites” appointed by the Establishment parties to RAI, the national public broadcaster. The government has since appointed Marcello Foa, whom the mainstream media complains has euroskeptic and anti-immigration views, to head RAI. I am actually not sure what Foa’s real views are but any step towards genuine political and ideological pluralism in the media would be step in the right direction after decades of cultural hegemony by the left. This is how we should assess the success of nationalist governments: To what extent do they slow, or even reverse, our demographic decline and replacement? To what extent do they push the culture towards a recognition of European ethnic interests and of the biological realities of human life more generally? All is not perfect however. In leaving the economy in the hands of M5S, the Lega risks worsening Italy’s economic underperformance. The Movement, whose ideology is generally vague, will make the labor market more rigid and increase government deficits. The Lega has supported M5S’s tearing up of EU deficit rules, but one wonders whether this will be sustainable in the long run. In any event, the government’s recently passed €15 billion budget, meaning a deficit of 2.4% of GDP, will fight illegal immigration and poverty in Italy. M5S represents a democratic tendency, that is to say a chaotic and entropic one, which is useful in breaking through the liberal system, making it own up to its own claims and contradictions. But in the end we want societies governed by right values, values in line with biological and ethical truths. Hopefully, if M5S’s popularity declines or if its policies become too costly, the Lega will be able to extricate itself. Certainly, the Lega has potential allies both on the conservative and the nationalist right which it might be able to turn to. Italy is then a good case study of how European nation-states, which are all inherently authoritarian, can “flip” rather decisively, as we have also seen in the Visegrád countries. I wish I could be as hopeful for France. Marine Le Pen’s National Rally (RN, yes, she renamed her father’s party . . .) is rather demoralized. The regime plays with Le Pen like a cat with a mouse, threatening massive fines for alleged campaign finance irregularities, which would bankrupt the party. The presidential and majoritarian institutions of the Fifth Republic mean that the French regime is quite secure for now, although it is true that President Emmanuel Macron has grown unpopular with stunning speed. These same institutions, which make it hard to “flip” France, would also probably make any future nationalist regime there rather more solid than the one in Italy. È finito il tempo dei burocrati di Bruxelles. Valori, orgoglio, libertà dei popoli e delle nazioni: a maggio la rivoluzione del buonsenso arriverà in tutta Europa. Western politics will, I believe, be increasingly dominated by right-wing parties with populist rhetoric. However, I am not sure how much these will actually reduce immigration. The forces aligned against them are enormous. The incentives are quite clear: a little populist rhetoric pays, actually shutting down immigration (let alone remigration) is much more difficult—as President Trump has found. However, we should take heart: we are making progress. On the basis of these trends, we can at least say that even if (if!) America and Northwest Europe are lost, Southern and Eastern Europe would be preserved as homelands for Europeans. On a less positive note, I would observe that the organizational capacity of Southern and Eastern Europe is depressingly low. These countries, for whatever reasons, are not capable of producing jobs and social well-being to the degree that young people want or expect, and many of them are going to Northwest Europe. Peripheral Europe is suffering a brain drain. This certainly “re-Europeanizes” Northwest Europe to an extent, but it is hardly promising for the future. In the end, the “Nords” will have to awaken too and come to understand both ethnic realities and the supreme value of our European heritage. This sure is an interesting article, I didn’t know a thing about those two political parties in Italy. I didn’t realize, also, that the Danes were dumb enough to think that enrolling foreign children in courses such as “gender equality, community, participation and co-responsibility” is going to do even a smidgen of good. Nature will win out. But the government won’t acknowledge this until after they’ve set up a 30-year observation period to examine the effects of this marvellous educational effort. In the meantime, the darkening of the light world will proceed. Surely, Eastern Europe is more European aka more White than Western Europe. But the overall situation is not good. Solution? Importing disfranchised Whites from South Africa. Maybe it’s time to start cherishing our comparative backwardness, underdevelopment, etc.? The (((economy))) has not been in the hands of the government for centuries now. “The Movement [M5S], whose ideology is generally vague, will make the labor market more rigid and increase government deficits. The Lega has supported M5S’s tearing up of EU deficit rules, but one wonders whether this will be sustainable in the long run. Rothschild controlled currencies were from the outset unstable and unsustainable. In fact, it was Rothschildian control of the lines of communication and their frightening the public into ditching an otherwise very sustainable economic model on the basis of “inherent instability and inflation” that allowed them to take control of the economy and turn it into the unsustainable mess that it is today. Great! Create more debt and future interest payments to a (((bank))) that has been behind socially engineering the invasion of the Italian nation by Africans and fostered the growth of an essentially (((wealth draining))) underclass. Take a lesson from Rommel in North Africa if you want to know how to handle Italians. Italy is a dogs breakfast as far as I can see. makes Italy the dysfunctional epileptic member that it is within the EU. ironically it may just be the Italian Criminal Syndicate that Regular Italians should look towards for their salvation. Loss of territory or “Lebensraum”. the Mafia has no such constraints. With the will of the people behind them, the Mafia could easily mount a war on (((treasonous))) elements within Italian society and African invaders alike. The same goes for the USA. If the treasonous police and (((bought politicians))) insist on obstructing order within society, then the people should rightly associate or align themselves with those whom they hold common ground. White biker gangs, Ex-military Militia groups, and other pseudo-patriotic groups are neither constrained by “fake laws” and have both the strength and the will to “get the job done”. but the (((Left))) has long ago been at war with Aryan America. The only thing (((the Left))) has not done is openly declare this war. So while Aryan America tries to retain its civility in the ongoing battle, the (((Left))) has never played by these rules. The (((Left))) has long ago picked this fight, the only thing that remains is for (((them))) to open declare the war…, something which they will never do as that would let the cat out of the bag and spell (((their))) doom. Italy will get punished by the “spread” (difference in yield between German and Italy treasuries) if it really starts to threaten the system. Still, the rhetoric is a nice change. The last paragraph is ludicrous. Italy is the second manufacturing power in Europe, btw. Only China and India have a population greater than the EU’s 508 million, with its own impressive and strategic landmass. Any genuine chosen supremacist worth his salt could explain to a child in a sand box, that it is easier to control Brussels than 28 individual capitals. And the chosen saturate Brussels with Mossad, media, lobbies, branches of their national and international organizations in and out of government and their exclusively ‘ well-intentioned ‘ collective Christian guilt- evincing hectoring and lecturing during extorted formal addresses by their military and representatives of their unique situational faith. [ Check it out ! ]. Bringing us closer to a possible situation I rhetorically asked Merkel about, on her personal e-mail, whether I might yet witness German troops pushing Palestinians into the Sea, in the interest of Israeli Lebensraum ? Little wonder, that the taboo breakers in Warsaw, Budapest and Rome are not the favorites of the multitude of Commissars representing their many Commissariats; their mere designation evoking memories of 1917 and the following 70 years of aberrations. NB The German word for piglet or a person in need of moral or physical hygiene, or usually both, is called a Ferkel. That noun is of neuter gender, preceded by ” das “. When Merkel is preferentially referred to as ” ‘ das ‘ Merkel “, instead of ” die ” Merkel — well you can figure out the rest ! Minor correction: Salvini’s first name is Matteo, not Mario. Politics is like religion, a belief system. Punctum! I usually end proto-arguments with dimwitted people I encounter from the left by merely asking “Would you prefer to live in Hitler’s Germany or Stalin’s Russia?” One “philosopher” that I will take time to read is Jose Ortega y Gasset who sensibly directed human attention to one’s personal existence in a fluid world, “I am I and my circumstance.” Basic, simple and operable. Ortega y Gasset was quite engaged with the concept of The European Man. Too frequently commentators on this blog confuse White Nationalism with Western Civilization. The former promote books on the ethnostate, “Camp of the Saints” novels and forcing non-whites out of the country. Such notions are delusional and counterproductive to the maintenance of Western Civilization. I have posted three links below showing racial interaction at the elementary school level, college level and adult self-selected behavior(two within a religious context and one secular). Before and after watching these, THINK…does any rationale person believe that White Nationalist tirades will ensure that the Whites in these clips will throw the others out? North Carolina, again! The Bailey Mount Cloggers of Mars Hill University- triracial, watch caller! I do believe there are differences among the races, certainly in mental acuity. There are medical disparities as well. Western Civilization is specific behavior set…a CIVILIZATION, not a race. A false dilemma, but if I were forced to choose, a Hitler’s Germany without Hitler would be preferable above a Stalin’s Russia without Stalin. Western Civilization is the creation of European peoples. Some non-Europeans can copy parts of it, but never catch its spirit. The physical preservation of European peoples is an end in itself, more important even than the preservation of Western Civilization, which after all could be reconstructed after its eventual destruction. If the European peoples would have been physically destroyed by mass non-white immigration and miscegenation, then everything is lost. About your videos, meant to “inspire”, multi-racial societies are an abomination. They are unnatural and at best produce a vulgar “culture” at the level of the lowest common denominator ( best example : Brazil with its noisy, lewd carnival). The last video I would characterize as “negrification”. Surely too it isn’t accidental that the universalist element in modern Christianity expressed in all these videos has been critical in supporting the invasion of the West by the Third World. In this it meshes in with the cosmopolitanism of the modern Left and the plans of big business. I normally do not reply to comments on comments, but yours prompts a concern about the deleterious consequences of dreamy, non-sequitur and imaginative fantasies about the future. “…Western Civilization, which after all could be reconstructed after its eventual destruction.” I now mention only two of the countless rational responses to such an absurd and indefensible notion. 1. Civilizations which “die” never return. Sumer didn’t, ancient Egypt didn’t, the Myceneans didn’t, the Etruscans didn’t, the Hittites didn’t, the Hellenics didn’t, the classical Greeks didn’t, Rome didn’t, and in non-Caucasian areas the Dravadians didn’t, the Maya didn’t, the Aztecs didn’t, and the Incas didn’t. All of these are covered in Toynbee and Spengler. 2. If it was merely “whites” who can rebuild white civilizations, it does not portend well for all the previous “white” civilizations which fell and disappeared forever. Fifty years ago Revilo Oliver reluctantly opined that perhaps the “White” race is incapable of preventing its own suicide and demise. Today the “white” nations of Western Europe, and “white” Commonwealth countries and America are not doing such a great job of preserving either their whiteness or their civilization. Those bold, adventurous Viking raiders and invaders have left history with weak, pathetic and condescending descendants who can’t and won’t protect their own countries or women. The mighty Teutonics are puddy in the hands of Moslem immigration. These are the protectors of “whiteness” and Western Civilization??? Those resisting attacks on Western civilization are Poles, Hungarians, Slovaks and Bohemians…groups long on the periphery of Europe. The videos I posted were to illustrate FUNCTIONAL REALITY in America today and I never even mentioned anything suggesting an “inspiration,” a supercilious comment from an illusory mindset and substandard reading of what I wrote. I could only wonder if you live in a medical-marijuana state. The so-called “White Nationalists” are completely non-functional. Whether walking around in pointed hoods, with biker tatooes, or burning crosses and attired in profanity laden tank shirts, they do not seem to represent the benefits of civilization. Mouthy bravado does not redeem anything. As for your nocuous comment about “unnatural,” if you had a cerebrally damaged child, would you let Ben Carson operate? “Negrification” is an interesting word I have seen elsewhere. Now I will suggest one about what I have read…stupidification. It is true: no civilization can be resurrected. Too much water has flowed under the bridge. We are not the same beings we were even 100 years ago, never mind 2,000. The earth itself is not the same. What is around the corner is anyone’s guess, but whatever it is, we would not recognize or welcome it if we could somehow magically find out. 1)My argument was that if Whites (not “whites” as you consistently write, probably because you think they don’t really exist or should not exist) would disappear due to miscegenation, then they never could be “reconstructed”(unless one is prepared to tinker with DNA on a grand scale). Loss of race is for ever. Civilization being transmitted by education THEORETICALLY can be reconstructed by education if it got lost. Whether that ever happened in history or could happen in the future is another matter*). I only mentioned this to illustrate the finality of the loss of race. 2)If you think that White Nationalists are represented by KKK and tattooed bikers, you must never have read TOO or similar publications. 3) I trust Whites more than non-Whites when it comes to technical proficiency, especially in health care, but there may be some individual exceptions. 4) Negrification IS a form of stupidification. *) The only example of the reconstruction of a part of civilization I know of, is the resurrection of Hebrew in Israel, which was a dead language for more than 2000 years. NEW YORK — Sportscaster Howard Cosell [Cohen] drank “before, during and after telecasts” and once threw up on Don Meredith’s cowboy boots during “Monday Night Football” after too much vodka, according to a new book by a former ABC executive. Spence, who worked at ABC for 26 years, was senior vice president of ABC Sports from 1978 until 1986. He is now president of Sports Television International, a production and marketing company. Spence devotes the first chapter to Cosell, whom he describes as an insecure, overbearing man who became impossible to work with late in his career. Cosell, 70, could not be reached Wednesday. A woman answering the phone at his home said he was visiting his wife at a New York hospital, where she is recovering from surgery. Cosell left the booth after throwing up on Meredith, one of his broadcasting partners. Spence said Cosell “again got out of control” during ABC’s telecast of the 1984 American League playoffs when he kept kept interrupting colleague Al Michaels. The next day, Spence got a call from Michaels’ agent, Barry Frank. “Al had told him that Cosell was drinking heavily and was impossibly argumentative, and that Al could no longer tolerate it,” Spence said. Left field post for sure, albeit interesting. Congratulations! Or have I missed something? Hmmm. I dare to disagree, and strongly. A “regime” is a newspeak for a government, which is not supported by centers of power. Accordingly, USA, France, GB, Germany and several other courties have “governments”, while Syria, Iran and, supprisingly, Poland have “regimes”. Obviously a regime may be promotet to being a government, when it wins acceptance of centers of power. 1. It destroyed, by means of legislation, the pathological employment pseudo-contracts, which plaqued labor market. The pseudo-contracts deprived employees of benefits, payed vacations, and left them with remuneration often as low as half of minimal pay. The pathology was so widespread, that even IRS used it to economize on labor costs. Previous governments, which were no regimes at all (of course), had been unable to cope with the problem, due to very many seriuos justifications. These justifications have not materialized, however. There have been no bankruptcies, no surge in unemployment, and no trouble at all. Many people, in small millions, got overnight raise of up to 100% and several other goodies that “governments” had been unable to provide them with for decades. 2. This “regime” has implemented a revolutionary child support measure offering the monthly monetary equivalent of about 30% of net minimal pay to every second and subsequent child in a family, irrespectively of per capita family income. And for poorest families even for the first, or only child. There is no typical bureaucratic trickery in the procedure. In fact, it’s the easiest public money available. In cash, not food stamps or other denigrating substitutes. Critics portended fiscal catastrophy. They are deeply disappointed. Poland, for example, has balanced budget. I’ve promised to write about two reforms, here they are for all to judge. Previously, when we had been run by “fascinating governments”, there was a veneer of child support, no employment decency, but a lot of blabbing about making things even more better, like “buttressing democracy”, “adapting European values”, and many other catchy, but void ideas. If it takes a “somewhat less interesting regime” to take care of most basic values, like decent employment conditions, or genuine child welfare, then I’ll gladly forgo “exemplary governments” altogether. Hello Framp. Thank you for your very interesting comment. I did not mean to say that the PiS government is as bad as liberal governments. Far from it! Rejecting (non-European) migrants and trying to raise the birth rate are very positive indeed.